Datical's latest release supports users bringing in their own XML changesets and changelogs from Liquibase. This on-demand webinar highlights the transformation Colonial Life made in bringing DevOps to the entire software stack. In addition, the presentation focuses on the critical role that data and the database play in modern software delivery and the tools Colonial Life used to create their Database DevOps process. Application developers want a fast DevOps process. But database deployments are often excluded from this fast-moving application release process and end up slowing things down. That’s because database deployments follow a different workflow, creating significant bottlenecks in an otherwise streamlined process. It doesn’t have to be that way. When it comes to database code, many software development best practices still apply. Come learn about mitigating the risks and challenges of database deployments and the 5 steps you can take to include the database in full stack DevOps. To keep up with the nonstop pace of innovation, organizations have modernized their application release automation tools to deliver better experiences faster. Movements such as Agile, DevOps, and Continuous Delivery have resulted in a steady evolution of application development and deployment innovations over the last two decades. However, practices around database continuous integration and delivery have not made the same evolutionary leap. In this video we are going to take a look at how Datical makes it easier than even to fulfill audit request and report on database changes across your organization. In this video we are going to focus how Datical can bring continuous deployment to the database. This video takes a closer look at how Datical brings automated continuous integration to the database. In this video we look at how Datical simplifies the development experience. This video takes a closer look at how Datical fosters real time collaboration and communication for database changes as they flow from development to production. This video is a short overview of how Datical enables faster, safer database releases to achieve CI/CD for the entire application stack. What is the best way to measure DevOps performance? There are many ways that people have tried to measure productivity in software delivery in the past -- what works and what doesn’t? In this webinar, Dr. Nicole Forsgren and Robert Reeves present some lessons learned about measuring software delivery and why it’s important. The webinar also highlights the key factors driving DevOps performance and offers a preview to some of the challenges on the horizon. It’s a fact: DevOps is now mainstream. More companies are embracing DevOps to work faster and smarter. But only a handful of those companies have gone "all-in" on DevOps. Culture, tools and training are key to success in any DevOps implementation. Understanding the important role each plays can mean the difference between organizations that have found success in DevOps and those that are still struggling. In this video a panel of experts discuss the “real” DevOps—what to know, where to go, where we’ve been and where we’re going. In this video, Delphix and Datical discuss how your organization can accelerate their goals for digital transformation by refocusing their attention on the data gap. Companies are adopting cloud native application and micro-services using Pivotal Cloud Foundry because it's easy. Companies get to focus on building the best application they can. 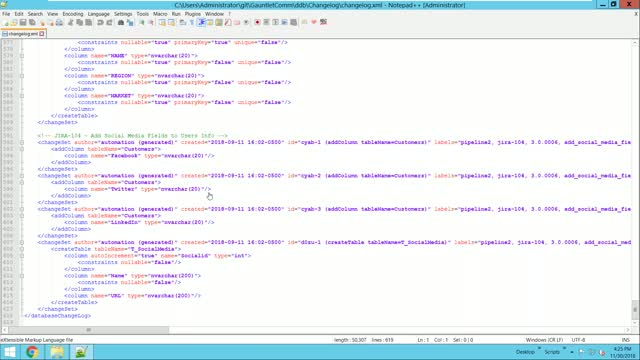 However when it comes time to deploy that application out to servers there is no way to update the database alongside those application changes. This video shows the value of using Pivotal and Datical together to speed your full stack application delivery. See how Datical’s Database Release Automation solution helps enterprises transform the way they build software so they can deliver better customer experiences, faster. Check out our customer case studies, product walk-thru's and expert briefs.